Purchase a 5 pack and get FREE Priority shipping anywhere in the United States! Aroma and Olive Oil - The Essentials of Healthy & Delicious Cuisine. Try a new and exotic way to cook, bake, and mix with extra virgin olive oil & doTERRA's CPTG therapeutic food grade essential oils. Extra Virgin Olive Oil is more than just another cooking oil, and doTERRA's CPTG Essential Oils are so much more than a delightfully fragrant aromatic spa experience. 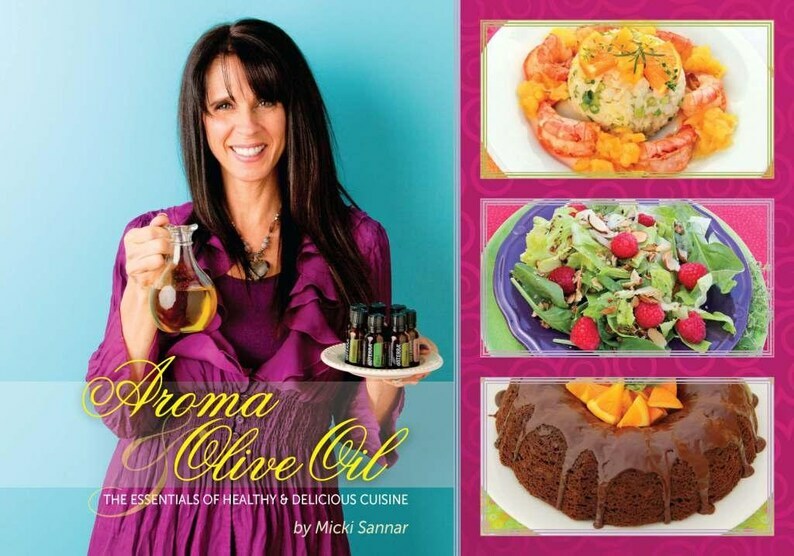 By combining these two time honored, flavorful, and medicinal oils Micki Sannar has discovered and mastered the art of preparing intensely delicious recipes with are good for your heart, mind, and soul. From the moment you begin using this cookbook, you'll quickly gain an insight into how to prepare the simplest yet most flavorful dishes that have ever crossed your lips. Pairing the purity of doTERRA's CPTG essential oils with real extra virgin olive oil, these recipes not only offer deeply delicious flavors, they also deliver the healthy therapeutic benefits Mother Nature intended. Because Micki's recipes are so easy to prepare, the chef in you will be delighted as you serve up simple gourmet dishes such as; Caribbean Shrimp with Warm Pineapple Salsa, Coconut Lime Rice, Healing Coriander Chicken Soup, Romantic Lemonade, and Lavender Vanilla Bean Cupcakes Just to name a few. In addition, people with various dietary restrictions are accommodated as many of the recipes are naturally Gluten Free, Dairy Free, and Vegan. Other dietary conversion charts and recipes to assist personal preferences are also available, This truly is one deliciously versatile cookbook! With Scrumptious images and 75 appetizing recipes, you'll enjoy your adventure into healthy cooking, baking, and mixing with the world's most amazingly delicious and healthy oils!